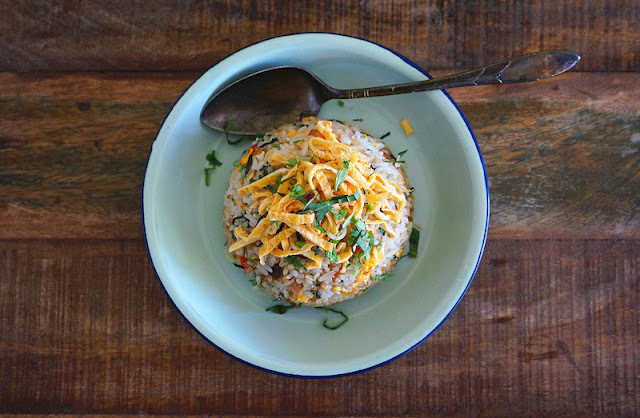 This is a great fried rice recipe, using the leftover Nasi Ulam. It's flavourful and tasty. Heat oil over medium heat and fry the chopped garlic until fragrant. Turn the heat on high, crack in the eggs, let it set, and gently move it around. Toss in the rice, chilies, and stir frequently make sure the rice is coated with the eggs. Add soy sauce. Then season the fried rice with pepper. Serve warm with some shredded omelette and chopped herbs or scallions.